This sophisticated two-bedroom, two-bathroom apartment features 1,371 sq. ft. of living space, complete with a master bedroom with two closets (including one walk-in closet) and master bathroom with dual marble vanities, laundry room, open living and dining area, inviting den, and a beautiful kitchen with quartz countertops, a gas cooktop, stainless steel sink, custom kitchen cabinets, subway tile backsplash and Whirlpool™ stainless-steel appliances. The apartment also features accent walls in both the living room and bedrooms, as well as nine-foot ceilings and stylish plank flooring in entry foyer, kitchen and laundry room. 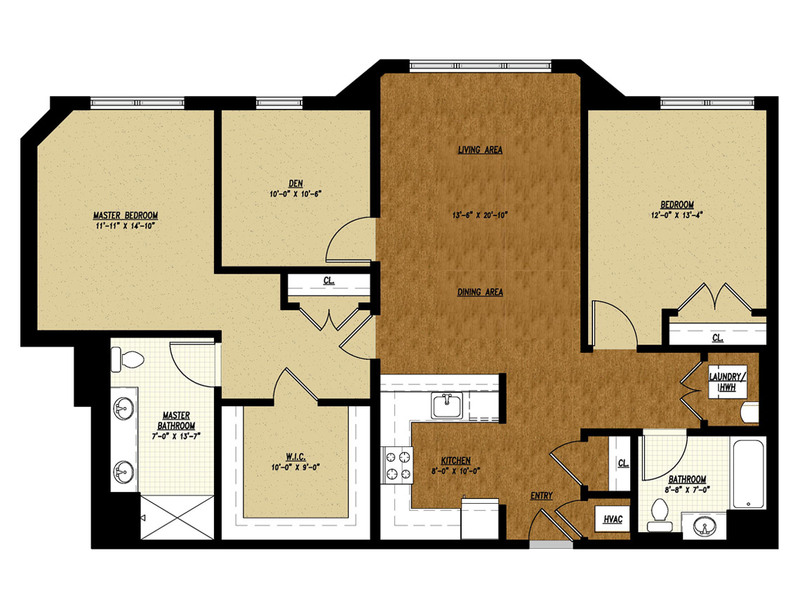 2 Bedroom with Den2 Bath Square Footage: 1,371 sq. ft.